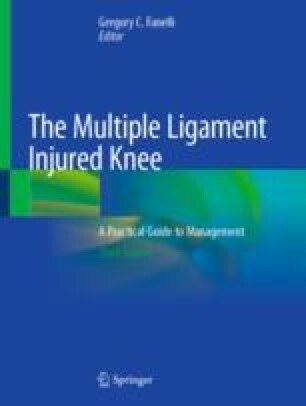 This chapter reviews our treatment approach to dislocated knees that involve injury to the anterior cruciate ligament (ACL), posterior cruciate ligament (PCL), and either the medial collateral ligament (MCL) or lateral-side structures of the knee. The treatment approach was derived from understanding injuries to individual ligaments and what the potential is for each of them to heal, the natural history of the injuries, and the effects of the injuries in combination. In general, the ACL does not heal after injury. In contrast, the PCL and MCL can heal well in most cases with conservative treatment. PCL injuries may heal with some laxity, but long-term outcomes are not different based on the degree of laxity. Lateral-side injuries tend to retract proximally above the joint and will not heal without surgical treatment, which involves taking the “en masse” structure and reattaching it to the tibia. Lateral-side injuries are the only ones that need acute or semi-acute surgery to achieve the best long-term stability. ACL reconstruction can be done in a staged manner if needed. The PCL will typically heal with nonoperative treatment and it does not need to be reconstructed. Our top priority is to obtain functional stability of the knee without the loss of motion that can lead to long-term pain, weakness, and loss of function.